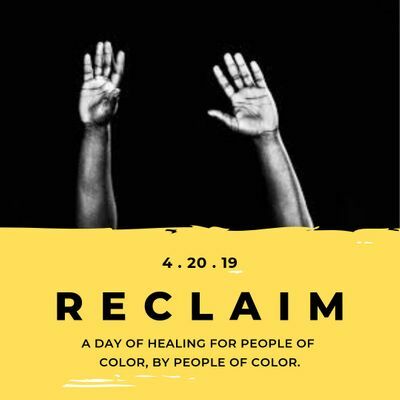 RECLAIM your narrative: a workshop on the impact of trauma particularly for people of color and healing tools to move through the trauma. This will be facilitated by two social workers of color that are passionate about working with communities of color and have their own private practices in the Upstate community: Gordon Collier, LMSW, and Rachelle Pean, LCSW. RECLAIM your language: a poetry workshop focusing on empowering ourselves using written and spoken poetry. These facilitators are 2 amazing published poets who have been featured poets in several poetry shows across the country: Karyn Dyer and Danielle Colin. RECLAIM your presence: an acting workshop focused on embodying our personal power using the art of acting. Aaron Moore will be facilitating this workshop and bringing his unique skill set that he's developed from being an actor in programming at the Capital Rep theatre, Proctors, Youth FX, and more. Food will be provided (vegetarian options available) and there will be sliding scale fee healing treatments available throughout the day (Reiki energy healing, massage, and gentle yoga). You identify as a person of color. You are in need of slowing down and learning different ways to take care of yourself. You are a beginner in your healing journey and are open to learning and sharing. You have been on this healing journey for a long time and want a place to reconnect with yourself. Please register through Eventbrite to save your spot, as spaces are limited! If you would like to donate a ticket to someone who is unable to afford the fee of $40, please do so! If the price is an issue, PLEASE reach out to us at cmVjbGFpbXlvdXJoZWFsaW5nIHwgZ21haWwgISBjb20= to discuss, there are options available. Let's breathe deep and take care of ourselves and each other.